The family has nothing but rotten maize to eat. Rescuers have had difficulties in delivering aid to the isolated Buzi area. Buzi, Mozambique. 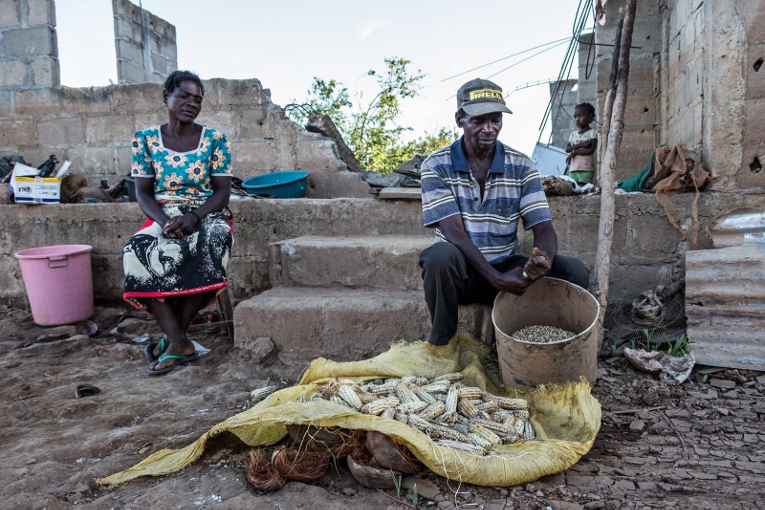 Amelia Tausene, 35, has a house and a field of maize and rice. The field has been her family’s source of income. Family has lived in Buzi for a long time, and they’ve seen the Buzi river flooding from time to time. Usually it has not been bad enough to disturb their daily life. According to Amelia, harvests have never been troubled by floods before. This time flood waters took everything, including seeds for a new crop. Amelia and her family, have nothing left, she says. Her children Noel and Gustavo show their school books, which are now useless. From what’s left, you can see that they’ve been diligent with their homework. Their school is also destroyed, and the two boys don’t know when they can continue learning again. 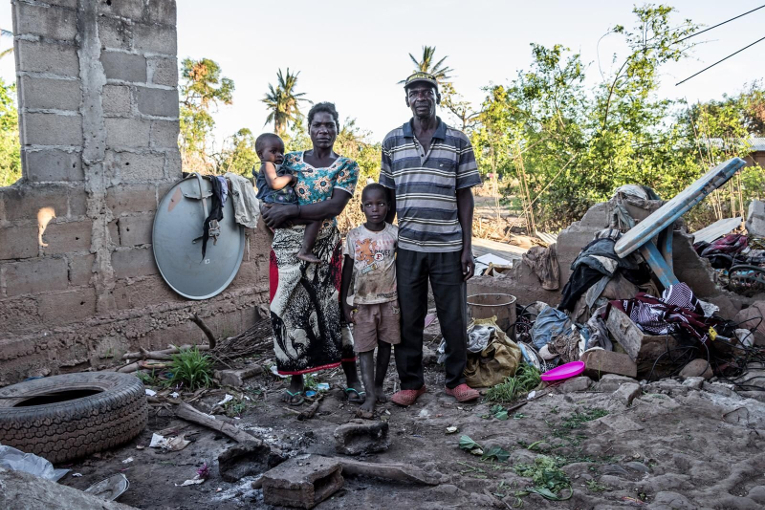 Buzi district and town seem to be one of the worst hit areas of cyclone Idai, which destroyed houses and caused devastating floods two weeks ago in Mozambique, Zimbabwe and Malawi. Amelia’s family has spent the last days searching for remains of their maize. The little that they have found, is now drying out in the sun. That’s also what they’ve been trying to eat, but it’s rotten and doesn’t taste good. Still, that’s all they have for food at the moment. The cyclone was something Amelia had never experienced before. But what came after was worse. It rained for two days after the cyclone, and, at the beginning of the third day, at 6 AM, the water level started rising rapidly. Amelia’s house is on higher ground, almost at the level of the nearby tree tops, and by 11 o’clock Amelia, her husband and the three children were stuck on their roof. No one had left their houses, because they simply did not realize how bad it would get. They had nowhere to go. However, they were lucky to be on the roof – other people had only tree tops. Amelia and her family had to stay on the roof for four days. They had nothing to eat, and the children were complaining, but she could not do anything. They survived by drinking flood water until a rescue boat came and took them down, and to a temporary shelter. Local rescuers tell us how a mother in this same area was stuck on a tree top with her infant. After a few days she dozed off for a few seconds and dropped her child in the water. People of this isolated area have been through a lot, too much. For us, it took 4,5 hours to reach Buzi town by road from Beira. By boat on Buzi river it takes three hours. The river is the reason why so many people have settled in this area. It’s ideal for farming. “The worst thing about the days of being stranded on the roof was hunger”, Amelia says. “We were only thinking of staying alive.” Now, when the floods are gone, Amelia has no idea what she’s going to do. “You see that I’m just sitting here, and this is what I have left”, she says, pointing at her destroyed house and the maize field that’s still partly under the water. Lorenzo Armando, 63 was born in Buzi. He has been farming since he was young. He says he has never seen a weather like this in his 63 years. In 2000, there was a small cyclone and flood, but water levels never reached as high as this time. Floods have previously stayed near the river Buzi, which runs through the town of Buzi. Lorenzo had 1,5 hectares of land almost ready to be harvested, but now all that is left and edible fits into a bucket. And, it tastes bad when cooked. Farming has become more complicated during the recent years; one cannot be sure when to expect the rains to start. When he was younger, rains were easy to predict. Now, the cycle of seasons is unreliable, and dry spells have become longer. That has a negative effect on the harvest. On the day of the storm, Lorenzo and his family were together in their house – his wife and two children Ruben and Maya. When the winds got unbearable, they left the house, and shortly after they saw the house collapse. Now there’s nothing left. But the worst was, when water started rising rapidly, two days after the cyclone. During those two days they had been trying to recover some clothes and equipment from the ruins of the house, and had left it outside. 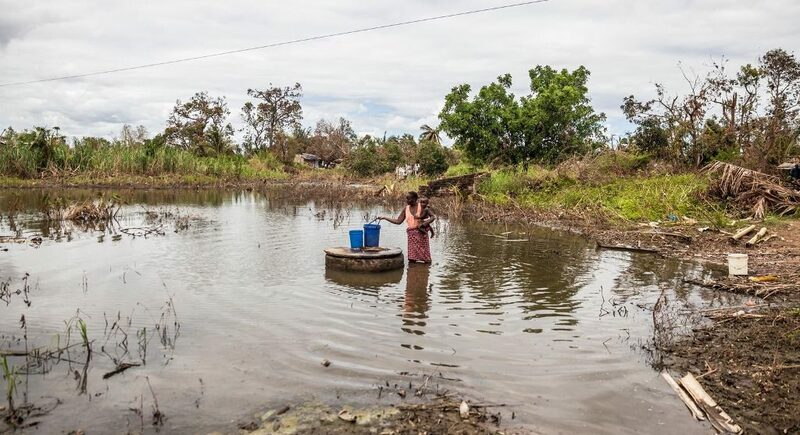 When water reached them, they started to move their belongings to a higher ground, but by the time they were done, water had already reached the same level. They panicked and decided to flee to a nearby guesthouse, which had two floors. They escaped to the top floor and stayed there until they were rescued. Now the couple sleeps out in the open air. They have heard of people in the area, who have lost their lives, or been swept away by the floods. Lorenzo and his family consider themselves lucky to have survived, but they don’t know, what to do now in order to recover from their losses. Farming was their livelihood, and now the harvest is gone. Buzi’s isolation makes it hard to receive relief. Luckily, they have received some rice and pasta as emergency relief. “To try to build at least one room for the family to live in”, Lorenzo says.